The winner was a simple customer-service campaign - using digital to make it easier for MBNA credit card holders to use their cards abroad. The judges described it as extremely commercially successful. It delivered great ROI, improved operational efficiency and a vastly improved customer experience. 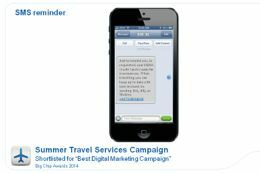 "Our integrated campaign aimed to make life easier for customers travelling abroad, and was timed to contact them 3 weeks before July’s peak holiday season. It promoted our innovative “Text2Travel” service, where customers can notify us when/where they are travelling via a single text message. This is vital so their card can be enabled for foreign transactions. The end-to-end experience was 100% digital, encompassing email, text and online content. Results were outstanding; 145k text notifications received; >5,400 customer hours saved by using the simplified digital service, and £286k cost savings from reduced contact centre traffic. " An entry in this category must include a significant use of online or digital technology to promote a product or service. Campaigns could include online advertising, viral marketing, email marketing, SMS campaigns and integrated on and offline campaigns. Entrants should demonstrate the effectiveness of the campaign in generating business (for the commissioning organization), directly or indirectly. Judges will be looking for ROI or tangible business benefit. This entry stood out in the category simply by delivering brilliant results. 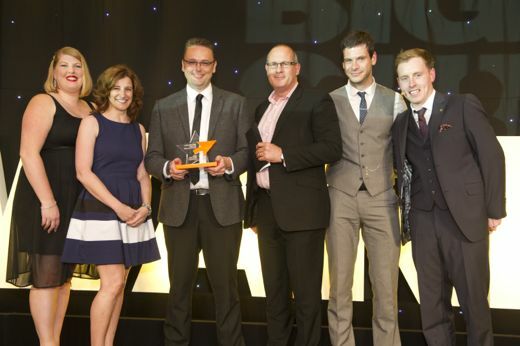 The judges thought the entire programme was well thought-out, reducing calls to contact centres, preventing fraud and delivering a fully branded experience to customers for the first time. But it was the results what won it. MBNA's brand new email programme keeps customers abreast of their latest account activity. The fully automated service delivers information straight to customers' inboxes, reducing their need to call in and check account information or promotional offers. Fraud prevention is also encouraged by asking customers to check they recognise certain account requests. The custom-built email tool allows on-the-fly changes to content, with our high profile business partners receiving a fully branded experience for the first time. From confirming a payment has been made through to reward point reminders, the programme marks a significant leap forward in our online communication strategy. An entry in this category must include a significant use of online or digital technology to promote a product or service. Campaigns could include online advertising, viral marketing, email marketing, SMS campaigns and integrated on and offline campaigns. Entrants should demonstrate the effectiveness of the campaign in generating business (for the commissioning organization), directly or indirectly. Join The Revolution was a multi-platform campaign aimed at increasing engagement with the Co-operative. The judges were impressed with the way all the media drove traffic to the social space, and with the level of involvement customers showed once there. More importantly, those engaged customers went on to transact across the Co-Op's family of businesses, delivering a positive return on investment. Amaze with Casting out the net for Saucy Fish Co. This award goes to a company that has shown innovation, humour and above all great quality work. The judges instantly agreed that this was the stand-out campaign among a number of fantastic entries. The use of mobile gaming and how it was integrated into the overall campaign will surely pave the way for future digital marketing campaigns. The challenge was that people didn't understand the flight upgrades until they'd tried them - which created the “Optathlon” campaign. Free advergames enabled passengers to experience and win free flight upgrades. A microsite hosted online versions for maximum exposure, and by playing the mobile versions, passengers could play to win an upgrade before boarding. The games have been played over 2 million times and 85,000 passengers won free upgrades, earning millions of dollars' worth of additional revenue for United Airlines. This year's winner won the judges' full support for a campaign gracefully executed and pitched just right for the target audience. With a great microsite as well as social media activities, it highly deserves this year's award. Until recently launching a product without the use of traditional media would be unthinkable. There's nothing wrong with shouting about your new arrival in this way. What if you don't want to shout? What if you want to build momentum, spread the word, in a more targeted and efficient way? Would you be brave enough to launch your most revolutionary products in years, a strapless bra that actually works and something women have been crying out for, with JUST a microsite, digital marketing, and PR for support? The Ultimate Strapless. No straps. No traditional above-the-line support. Just record sales. Digital Marketing requires the pretty obvious intersection of digital and marketing but it's seldom that agencies actually get the balance right. The winning work here struck exactly the right chord, encouraging 25,000 people to create a design online, 1 million people to vote and over 3 million page views within a 3 month period. And it delivered a 500% increase in audience from last year's award-winning campaign. Dr Martens wanted to reconnect and increase relevance of their brand to the younger audience. Technology enabled this to happen instantly and globally with an online competition to find the design for the next 1460 boot. Building on the success of the previous year, they launched a second round in 2008, giving people the chance to leave their mark on two blank iconic canvasses. Round two of The Brief also had two winners with one selected by the public and another by an industry panel. Additional campaigning tools enabled entrants to display designs in their own personal web spaces. This was an entry that made us laugh out loud, bringing a potentially dry subject to life. Best Digital Marketing and Brand Development was won in 2008 by Love Creative with design a boot.